Successful speakers pay attention to the details. By anticipating some of the most common Speaker mistakes we can prevent them.
. Too Much Material can overwhelm an audience. Too much data prevents the audience from remembering anything, as they tend to shut down and switch off. Limit your points to three if possible. 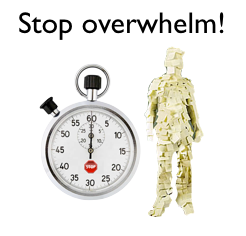 Overwhelm is one of the most common Speaker mistakes.
. Starting or ending late shows a lack of respect for your audience. Get to the venue early, ensure your have prepared and have tested your equipment. Be prepared to adjust your presentation if the day is running late. Be clear, be brief, be seated. 3: Generic material. A presentation can lose impact when a speaker gives the same speech to every audience. An unprepared speaker can easily turn a receptive group into a hostile one. What worked at a marketing association can alienate a group of accountants. Tailoring your presentation to the specific group shows you care about your audience and helps engage your audience. Do your research. 4: Lack of structure. No matter how interesting your topic, without an easy to follow structure you run the risk of losing your audience, and confusing them. When designing your talk/presentation make sure you have a clear purpose and focus, ensure your major points support that purpose. You should be able to summarise your talk in one sentence. Each point should reinforce this clear message.
. Dress appropriately for your audience. A simple rule of thumb is to dress one level up, or down, from your audience. Be smart, well groomed and neat. As speakers we need to study our audience and dress and present appropriately. 6: Poor Use of Visual Aids. Your visual aids should support and enhance your message, not overshadow it. This is another of the most common Speaker mistakes. Practice using your equipment and Visuals aids. Have a back up plan in case your equipment does not work. Don’t assume all technology is compatible; test it in advance. Have your presentation on a memory stick as a back up and a printed copy of the presentation, just in case.
. Speaking in a monotone can put your audience to sleep. The quality of your presentation matters as much as the content. When you plan your presentation script where you can use vocal variety (softer, louder, pause, varied pacing) to augment your message and engage your audience. 8: Lack of Audience connection. As a speaker we need to connect with our audience, remember the audience is silently asking “Why should I care about what you are saying?” A self-involved speaker, who is unaware of their impact on the audience, soon loses their audience. It is always about the audience.
. Make sure you research your points. Speakers lose credibility quickly when the information they present is incorrect. It is not just about presenting points; speakers must build a case in their presentations. Including Stories, analogies, demonstrations, pictures, testimonials, references, and simple statistical data add to the validity of your presentation. 10: Lack of Silence. Some speakers don’t know when to keep quiet. Silence can help make a point. Allow your message to sink in, and the audience contemplate your important points or questions. Know when to speak … and when to keep silent. Remember to keep it simple and relative to the main theme of the presentation. If it does not clearly make your point, for your audience, cut it. If you want to learn how to create One Clear Message in your speeches and presentation avoiding the most common Speaker mistakes then contact us today!